Break a Guinness World Record and help children with cancer! Do something remarkable for an inspiring cause that you will remember forever! On 14 October, you and thousands of other participants will gather together to attempt to break the Guinness World Record for the most people folding recycled paper planes simultaneously. You will then witness the moment when thousands of paper planes fly simultaneously. All on your doorstep in the centre of Cambridge! By participating, you will help us to raise funds for a life-changing aeroplane. The specially-equipped aeroplane will help children with cancer or other serious conditions to fly to their next treatment, to the places of their dreams, or to the family they haven’t seen in a long time. And you can even have your name painted on the aeroplane! Learn More about the programme "Fly Through Cancer"
Why are we attempting to break a Guiness World Record? At Please Take Me There, all our work is positive and inspiring. You will never find us making street collections, cold calling, door-to-door campaigning or even using distressing images. A Guinness World Record Attempt is a positive way to bring the community together and offer life-changing solutions for many sick children and their families. A mind-blowing event for schools and families. A wonderful opportunity for your family, school and the wider community to be involved in something exciting and unique. Find us out and about in Cambridge! This summer, we will be in the schools, streets and parks of the city to give you details of our event, and help you learn how to fold a paper aeroplane as fast as possible. Join us, and understand how your involvement can make a real difference to children who are, in many ways, just like you. To arrange a workshop in your school, drop me an email at hello@pleasetakemethere.org, or get in touch over the phone on 01223 653 133. Already a registered participant? Let's get ready! In preparation for the event, you can join us in several free workshop in Cambridge, watch our preparation videos, follow the updates on social media and fundraise to help transport children with serious conditions. WOULD YOU LIKE YOUR NAME ON A REAL AEROPLANE? As a participant in the Guinness World Record Attempt, you can create a fundraising page. This will help you raise an amount of your choice for Fly Through Cancer, a programme that aims to get a life-changing aeroplane off the ground, to fly children with cancer to treatment, to their families or to take them to the places of their dreams. If you fundraise £100 or more for Fly Through Cancer, your name will be painted on the fuselage of our specially-equipped aeroplane as soon as we raise enough money to buy it, as a sign that you are helping many people in the UK and around the world. No matter where in the world the aeroplane is flying, your name will go with us. On the 14th October 2018, you'll be taking part in an official attempt to break the Guinness World Record for the most people making recycled paper aeroplanes simultaneously in a single place. According to the rules, each participant will need to fold at least three paper planes within 15 minutes. Folding a paper plane isn't rocket science, but don't forget that you'll be folding a special model of plane, and you will be standing! If 10% of the participants don't fold three paper planes within 15 minutes, we won't break the record. So it is important to practice! Over the next few months, we will be running street workshops all over Cambridge. You can pop by and fold a paper plane to get ready for the big day - follow us on Facebook to find out where we’ll be! If you can't come, don't worry. Start with this video below and check your email and Facebook for more videos and tips. HERE IS OUR PAPER PLANE! This is the recycled paper plane we are using. The model is pre-approved by Guinness World Records, and will be given to you when you arrive at the event. 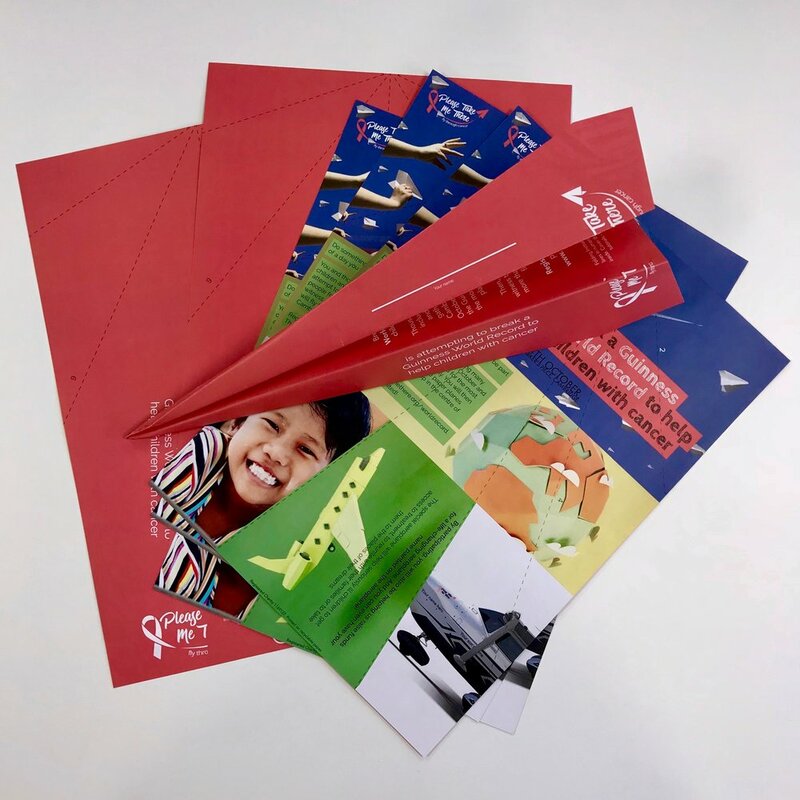 If you would like us to send you some of our paper planes, please email us with your name and address at hello@pleasetakemethere.org, or call 01223 653 133. You can also download the template here. You need to print it double-sided and if possible, with a borderless printer. Our team is here to help. Contact us via Facebook Chat on this page, by email at hello@pleasetakemethere.org, or give us a call at 01223 653133. If you’d like to meet us in person, we can arrange a cup of coffee and a chat in our office at 20 Station Road, Cambridge.